UPDATE 11/7/09: New compact controller mounts flush with deck! When selecting a project for the MIT Edgerton Center's Summer Engineering Workshop, there are several criteria to be considered in order to uphold tradition. Amongst the more important of which are simplicity, style, rideability, and of course, some extent of "researchiness." So then, it's got to be an electric kick scooter. Well, that's been done, you say. They're all over the world wide web, you say. 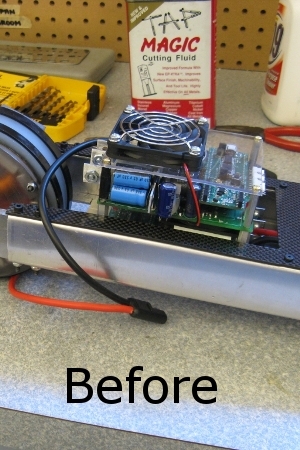 Fine, we'll fit ours with a custom brushless hubmotor. Charles already did that?!? Blast! 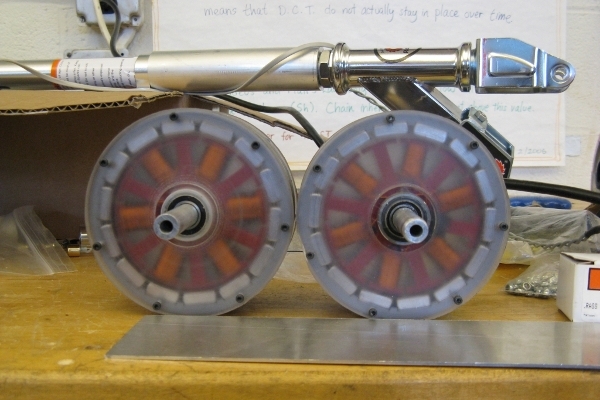 Then we'll power ours with TWO hubmotors! Now this is serious. By no means is this an innovative feature of our scooter. What is notable is that excluding hardware, the front steering assembly/thrust bearing is the only off-the-shelf part used. It was easy to extract and re-mount, and also saved hours of painstaking manual labor trying to replicate an already perfect part. The stock handlebars were a little short, so we extended them about 6" and mounted a motorcycle-style twist throttle. So, was it worth the $60 Razor Spark price tag? We certainly think so. 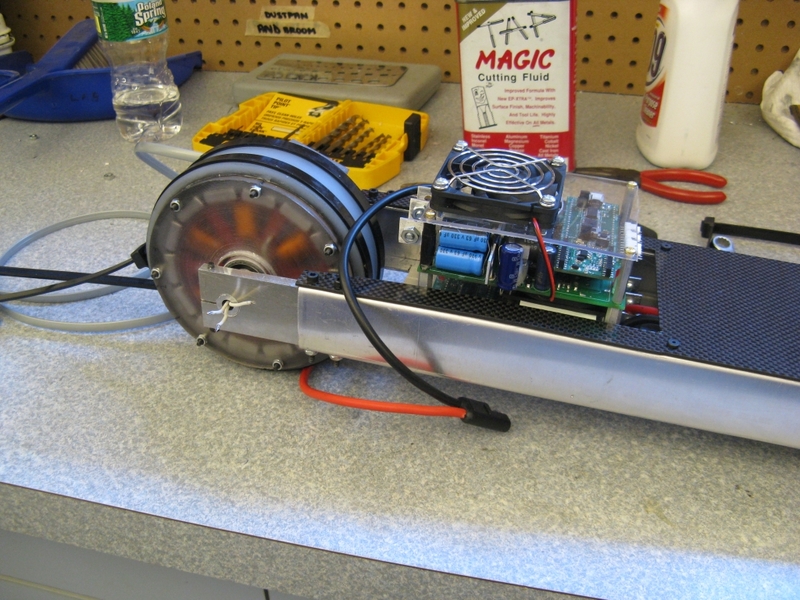 Two custom brushless DC hubmotors propel the scooter. 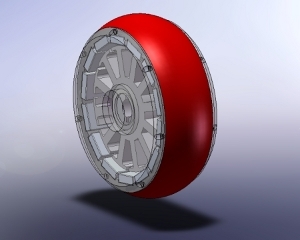 A hubmotor is a self-contained motor and wheel assembly all in one piece. This works by using a brushless as opposed to a brushed setup, where the stator (stationary part) and rotor (rotating part) are inverted. 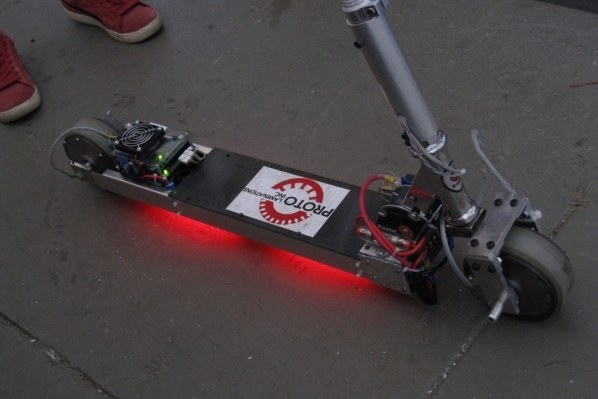 Since the motor makes direct contact with the ground surface, there are no gear ratios to deal with. 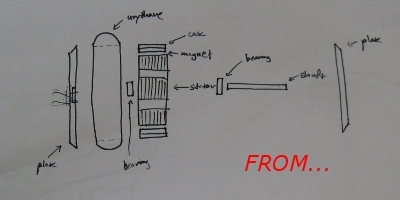 At the same time, this meant we had to factor in torque output and maximum rpm when designing the motors. 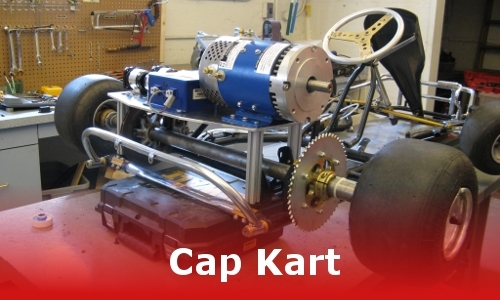 Rough specs per wheel are: 14 neodymium magnets (poles), 12 tooth stator, 30 windings (turns) per tooth, 5" overall outer diameter (including urethane), producing peak 590 watts. Read below for a more thorough explanation and for details on the build process. 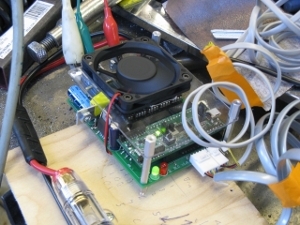 The controller is based on a tried-and-proven design painfully develped during last year's project. This time, it's been repackaged in a more compact, 3-phase version for driving the brushless hub motors. The controller takes advantage of very powerful MOSFETs from International Rectifier (IRFB3207 and IRFB3077), each of which can handle as much as 100A for brief periods of time. Cooling is done with a 60mm fan. The controller detects the position of the rotor using external hall-effect sensors, allowing it to do static torque control (no kick-start required) and full regenerative braking. 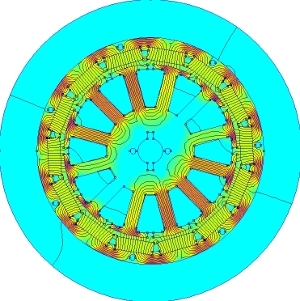 While designing the motor we took advantage of free magnetic simulation software called FEMM. You can make some very rough predictions using basic physics (and we did) but for a realistic estimate of the torque production of a given motor design with complex geometry, simulation can help a lot. FEMM can import .dxf drawing files from SolidWorks (our favorite CAD software) so it was easy to integrate the simulation with our design. 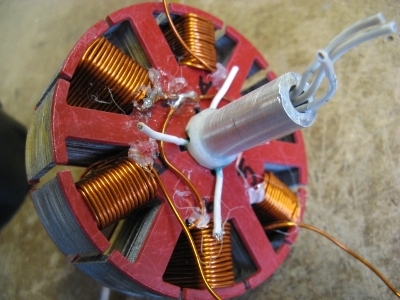 The motors were nowhere near as complex to build as they look. Especially when you consider all the laminations, made from M19 steel and laser cut for us, for FREE! Thank you PROTOlam!!! The rotors consist of 107 laminations (its just worked, ok?) and the stators 68, each out of .014" steel. That puts our rotors at about 1-1/2" wide and the stators at about 1" wide. 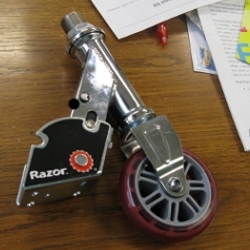 Although this makes for a fatter wheel than the original scooter, they will produce more torque. Stacking the laminations was a simple matter of crazy glue. A thorough coat was applied to the perimeter, and the perimeter only, as the windings will constrain them in the z-axis. 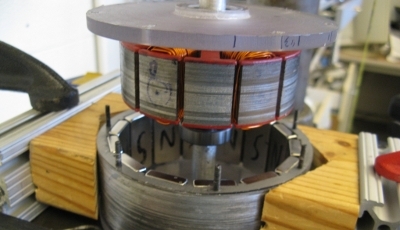 Winding the stators was a trial and error process. We used 18 guage magnet wire because 16 was just too unfriendly to manipulate. You may notice that there are red plastic covers sandwiching the steel laminations. In our first winding attempt, we wrapped all sharp edges with electrical tape to prevent scratching the insulation. Electrical tape was not enough. These plastic covers were cut so that the teeth are slightly wider and thus there would be no chance of shorting. It was a two to three man job to count, neatly arrange, and wrap the windings. Every other tooth was wound, 30 turns per tooth, LRK-style wiring. Assembling the rotors was no easy feat. For ludicrous torque we opted for the neodymium magnets with a remanence of over one Tesla (very high). 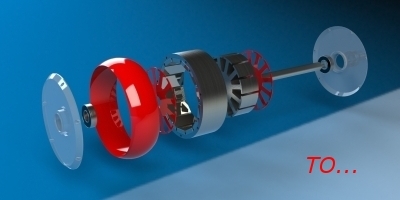 Recomendation: if you plan on building your own brushless hubmotor, be sure you design the rotors to have shallow indents that accept the magnets. This way, the magnets will eventually snap into place as they have three flat surfaces contraining them. Even with such indents, getting the finger-comfort-oblivious magnets into place is a two-man job. Again, we chose crazy glue to hold the magnets to the rotors. Once all 14 were in place, they probably held each other together because they alternate polarity. But these are NEODYMIUM MAGNETS! and you can never be too careful. When our rotors had magnets and our stators had windings we were presented with the difficult task of how to put them together. 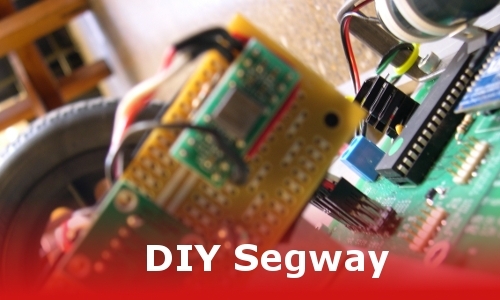 The trick is that you DO NOT want the magnets to snap to the stator. Once this happens good luck ever getting the two apart. Our solution (do I want everyone to know? 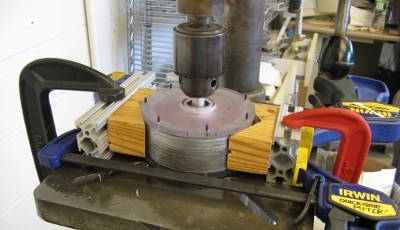 ): place a shaft through the stator and set that in the chuck of a drill press so that it is contrained on two axes. Next, we cut a pair of wood triangles and used clamps to get a grip on the rotor. 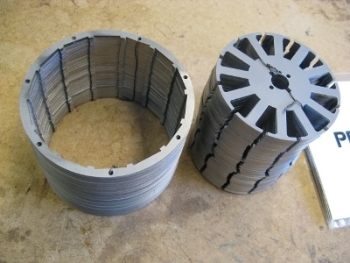 Finaly, clamp down the triangles - and stator - to the drill press plate and press in the stator. The rotor had a tendancy to fly up to the stator so we had to use multiple clamps. 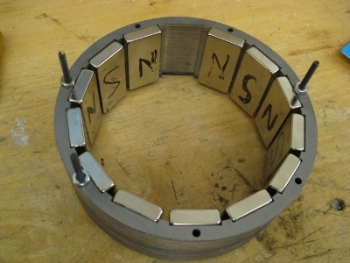 This process is made easier if you make endplates with bearings to lign up the shaft-stator assembly. We also used the bolt pattern on the plates as another way of aligning the stator. The deck was originally to be made from 1/8" sheet aluminum, but this turned out to be more like an 1/8" plate. With persuassion it would bend on a brake, but after the first bend, it would not not clear the teeth. The final product is bent from 1/16" aluminum; which is less structurally sound but we will make up for that in reinforcement. We took advantage of carbon fiber's incredible tensile strength (good looks) to make a cover for the deck. 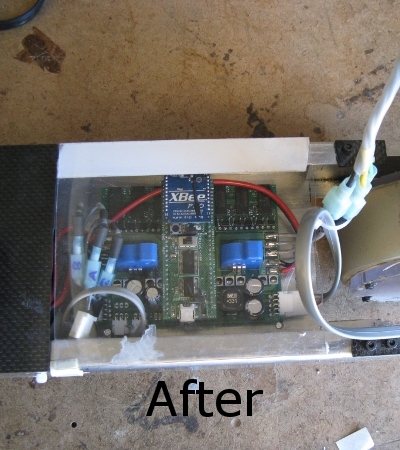 A separate cover/fender will be made later to protect the two super-compact motor controllers. In the rear, forks, carrying the torquier hubmotor, were hand cut and drilled out of 1/4" aluminum plate. Originally the tread for the wheels was going to be a custom urethane molding. However, that would have set us back around $500 just for the two pieces. For a cheap(er) fix, we bought a strip of 1/4", 80a, urethane and cut it to spec. 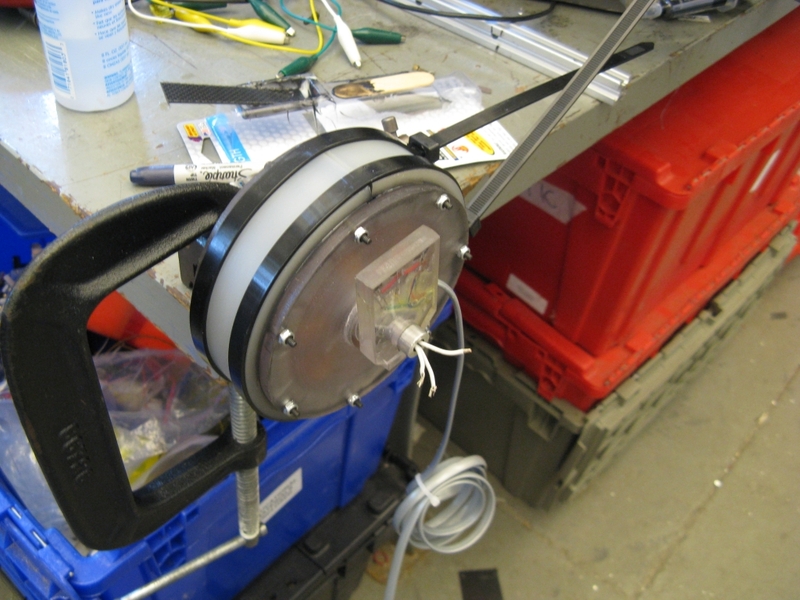 The urethane adheres to the rotor with the help of "Plastic Steel Steel Weld Epoxy", and zip-ties for now while it sets. We chose to use 80a ("#a" is the rating of hardness) for our tread because it is durable yet soft enough to provide great traction. Hopefully with wear 'n tear the urethane will shape itself, but if it does not we can always grind it down. 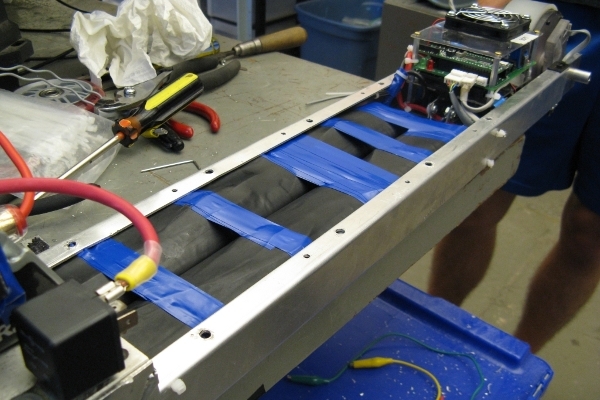 The battery pack is comprised of 20 A123 cells, tab-welded, shrink-wrapped, and electrical-taped, together. Thanks to some careful consideration of the deck dimensions and wire placement, the batteries slide right in without much persuasion at all. We'd like to think the battery pack isn't an integral structural component, but I suppose that all depends on the weight of the rider. We experienced some slight torsional warping of the frame, specifically at the joint where the handlebars mount to the deck. To fix this we fitted an aluminum plate on either side which should handle the load acting on that joint. We'll see after some testing. The new controller mounts flush to the deck to free up some much needed foot-space. The main difference is the use of surface-mount components, making the whole assembly more compact. 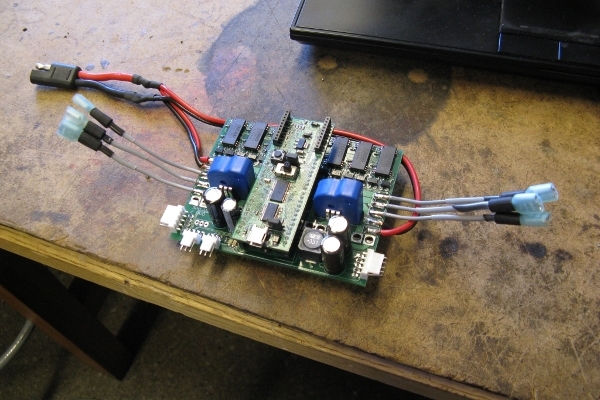 Similar to the previous controller, each motor gets six transistors, two for each phase. One connects it to +33V, one connects it to 0V. This is called an inverter, since it turns DC from the battery into "AC" for the motor. At any given time, the phases are either high, low, or completely off depending on where the rotor is. Meaning, one phase is always high, one is always low, and one is always off, but they rotate based on the sensors attached to the wheel. The "high" phase is actually rapidly flicked from high to low at 15.625kHz to give it speed/torque control and regenerative braking.